Recognized with the AAA Five Diamond Award, this 401-room resort promises exceptional service and guest satisfaction. It is tucked around a ribbon of crystal-clear waterways and sheltered under a forest canopy, and located beside a secluded beach near one of the world's largest reefs. Turn moments into memories while enjoying four exceptional restaurants, five bars, state-of-the-art Willow Stream Spa, a Greg Norman championship golf course, plus rooms and suites in spacious casitas. Located approximately 40 miles south of Cancun near the town of Playa del Carmen, on the Tulum corridor in the province of Quintana Roo. The Fairmont Mayakoba has four restuarants to choose from, Las Brisas Restaurant & Lounge Bar, El Puerto Restaurant, La Laguna Grill & Bar, Las Olas & Aqua Pool Bars. Guests can take nature tours of the property, which features indigenous forest, exotic mangrove trees and a wide variety of tropical flora and fauna, or visit one of the local eco-parks including Sian Ka'an. 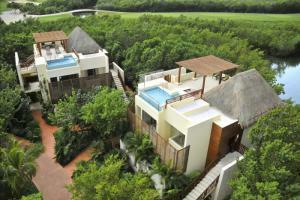 Nearby, Playa del Carmen provides an exuberant nightlife, in addition to sophisticated boutiques and fine dining.